The Russian State Duma has passed a law allowing advertisers to market beer brands at stadiums and during televised sporting events. Accordingly, Russian brewing firms are already preparing to spend around $145 million on advertising. Observers have pointed to Russia's hosting of the 2018 World Cup as one reason for repealing the 2012 prohibition of beer commercials. The lower house of the Russian parliament - the State Duma – has approved a proposal to upend the ban on beer commercials during official sporting events in two final readings, just before the start of the summer recess. The process of deliberation occupied lawmakers' attention for a record 10 days. Beer advertisements will be allowed in stadiums and during television broadcasts of matches, and the bill's provisions will be in effect until 2019. In addition, the Duma has extended its authorization of beer marketing to print publications, so long as the ads are not found on the first or last page. “First and foremost, this decision was dictated by the needs of the coming 2018 World Cup in Russia, the title sponsors of which are the largest transnational beer companies in the world. It will be necessary to attract more advertising revenue, increasing profitability and getting a better return on investment for this large-scale project,” said UK Finam analyst Maxim Klyagin. Moreover, according to Klyagin, the effect of the economic downturn budget deficit cannot be ignored, and developing alternative sources of financing will be an urgent task. The return of advertising has pleased commercial brewers. “Over the course of many years now, Baltika has supported various forms of sport, various clubs and leagues. Cultivating sport has always been one of the company's priorities for community engagement. Our brands have always been promoted with complete observance of the law,” Baltika’s Vice President for Marketing Maxim Lazarenko told RTBH. Baltika, which is part of the Carlsberg Group, is the largest beer distributor in Russia. “It is good to know that the prior limitations on advertising at sporting events, in print, and on television have been lifted in anticipation of the 2018 World Cup,” Lazarenko said. Baltika has sponsored a wide array of sporting events around the country, including the Russian Football Championship. “In countries where beer is the national beverage (Germany, the Czech Republic, the Netherlands, et al), and where beer is a lunchtime staple, advertising is unrestricted and a common practice,” said Sergei Zuykov, general director of the law firm Zuykov and Partners. Moreover, in the U.S., Bud Light has been named the official beverage of the NBA. In turn, the well-known American beer brand Samuel Adams is the official sponsor of the Boston Marathon. “For another clear example set by overseas brands, one can also turn to Heineken and its many years of cooperation with the UEFA Champions League,” added Alexei Kozlov, UFS Investment Company’s head analyst. In 2002, sales of beer were strictly prohibited at stadiums and all sporting events. The restrictions were motivated by the chaotic aftermath of the Russian national team's loss to Japan at the World Football Championships, when fans staged riots in the center of Moscow. 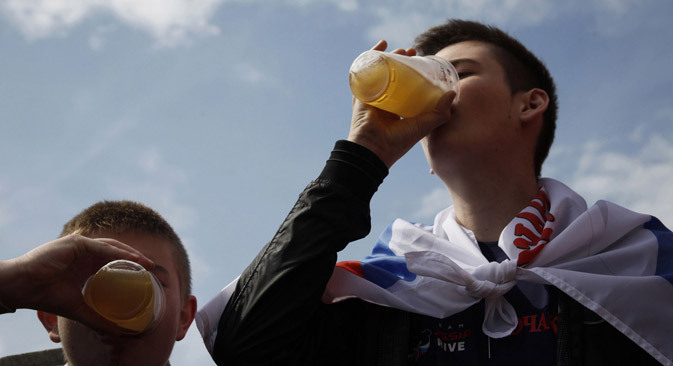 Russia thereafter became one of the few countries where retail sales of beer at stadiums were illegal. The governmental attack on beer advertising began in 2004, when ads were forbidden at stadiums and on television during daylight hours. Then, starting on January 1, 2005, beer commercials could no longer contain images of people or animals, until such commercials disappeared from television and radio altogether in 2009. Dutch brewing company Heineken estimates that Russian beer distributors are now poised to invest 5 billion rubles ($145 million) on advertising during sporting events. Even when the advertising ban was in place, commercials for Amstel’s non-alcoholic beer were allowed on air, starting in June 2014.